After a reasonable start to the season and a couple of ballsy displays by the squad (Montpellier and City away) we had the right to start believing we had as good a chance as any of the other contenders for a title tilt. Chelsea at home….no problem….they hadn’t really had a test yet, we’d been away to the Champions and bossed them for ninety minutes, save an unfortunate occurrence at a set piece, ah defending set pieces, more about them later. 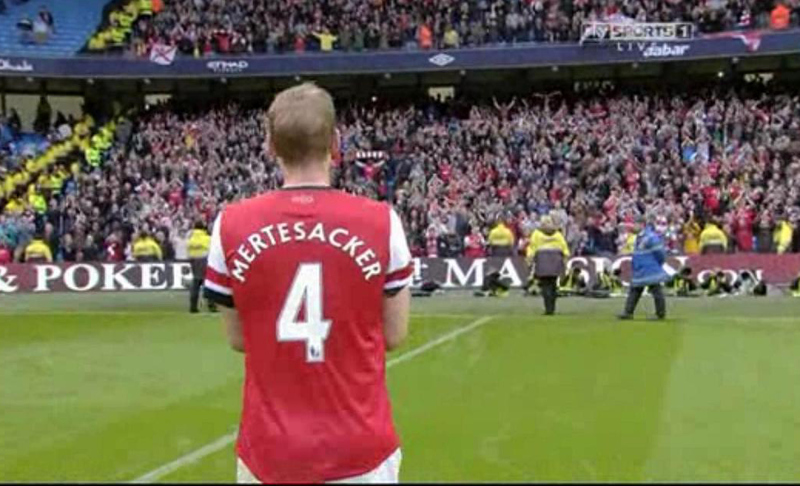 The big surprise of the day was seeing Mertesacker sitting on the bench. I advocated Koscielny and Vermaelen starting today’s game, but Arsene very rarely agrees with me. Koscielny had put in a good performance at City and Vermaelen as Captain has to start the big games if fit. However Mertesacker has not put a foot wrong this season and has every right to be annoyed at being left on the bench for the game. With Chelsea’s new playing style (ie not lumping it up front to Drogba) it was understandable that Wenger decided on our two more mobile and pacier centre backs over the positional strength of The BFG. Torres runs across the line, and from midfield Chelsea have Mata, Hazard and Oscar all able to move at speed with and without the ball. Arsenal lined up in our now traditional 4-3-3 formation whilst Chelsea appeared to adopt a more fluid 4-2-3-1. This made it very narrow on the pitch and swamped the midfield but the movement of the more advanced players means they pop up everywhere. From the kick off Chelsea controlled possession well, but they were not overly threatening in the opening stages, the final ball normally being picked up by a red and white shirt before getting to the real danger areas. What they did do well was press our players high up the pitch when we had possession, this resulted in hurried passes, and we seemed to lack the movement and options to get out of our half quickly. Something that up until now has been part of our success this season. The first strike on goal was from a Luiz free kick from over 30 yards which Mannone gathered comfortably. The next two chances fell to Arsenal, Cazorla shooting over when well placed and in space on the edge of the Chelsea area, and Diaby making space for himself to produce a shot which was saved by Cech. Sadly for Abou this was to be his last meaningful contribution as he appeared to tweak his thigh on shooting. The change took a while to make as the ball seemed to take an age to go out of play, in that time the easy decision to drop Ramsey back to midfield and put Ox on to right wing was made, but there seems to be a fault on Bouldy’s iPad app, as surely it should have a very loud alarm that says “WARNING: Oxlade Chamberlain 5ft 11 – David Luiz 6ft 2 (plus hair) you may want to reconsider”. Very soon all Gooners in the Emirates and those watching at home were ruing the negligence of the iPad app as we all watched in horror as the Ox tried to mark up Luiz at the next set piece. The free kick had been awarded for an unnecessary foul from Vermaelen on Hazard, we were well set and there was simply no need for Vermaelen to lunge in as he did. Mata delivered a high ball into the box, which cleared the head of Luiz and found Torres at the back post outmuscling Koscielny and hooking the ball into the net. Two set piece goals in two premier league games. Chelsea know how to defend, they are a well organised unit, and they do not lose their shape very often. So the task of equalising was not easy, Arsenal set about finding the goal we started to control the ball further up the pitch and for longer periods. There was little goalmouth incident as Chelsea marshalled the area directly in front of the goal, and allowed us to keep putting crosses in to a crowded area where blue shirts outnumbered the red ones. It looked like we would be going in one down until following good work on the wing the Ox produced a low cross that nutmegged Ashley Cole and found Gervinho who had lost both Terry and Luiz by standing still. The Swerve took one touch and with his second rifled it into the roof of the net as he turned, a well deserved equaliser and a fantastic strike for this seasons leading scorer. In truth Chelsea looked a little rattled after the goal and the half time whistle came too soone as Arsenal started to dominate the play. After the break we continued as we had left off attacking and creating opportunities, both Cazorla and Ox missing the target with half chances. To gift one set piece goal is foolish, two gift second is suicidal in this league. Vermaelen chasing back from the edge of their area (answers on a postcard as to why our centre back was on their 18 yard box in open play) bundled Torres over for another soft free kick. The delivery from Mata was vicious, Gibbs could probably have put a head on it if he hadn’t have been pushed over by Ivanovic, and Koscielny trying to stick anything he could the ball could not stop the ball going in the far post. A comedy of errors from start to finish, well at least it would be a comedy if it was happening to any other team, as its happening to us it’s a tragedy. After Chelsea’s second we had to commit more players forward in search of the equaliser this led to Chelsea looking more threatening as they broke in numbers into open space when they regained possession, that said they didn’t create another clear chance on goal from memory. We created the majority of the chances in the rest of the game, Podolski saw Cech palm a looping header away, Giroud saw Cech somehow get a strong enough hand to a deflected shot from Giroud, Cazorla had a very nice position to equalise but pushed his shot the wrong side of the post and finally Giroud had another chance after being played in by Cazorla, he tried to round the keeper but Chelsea were back in numbers and scoring was not easy (unless of course your the fan who likes a scapegoat then it was a yard out in the middle of the goal and there was not a defender or keeper within a mile of him and it was harder to miss than score). So do I think we deserved a draw then? The answer to that simply is no. And the reason it’s a no is that you cannot give two dreadful goals away and say we deserved a point. Unfortunately when you give goals away you get what you deserve, and it’s been happening for too long now and for me it’s very easy to fix. Its simply a question of where we hold the bloody line for free kicks from outside our 18 yard box. Time and time again we set our line and are pushed back by the opposition. It happened on the first one, but to a lesser extent with only Koscielny being pushed back, this was compounded by Luiz getting the wrong side of the Ox which meant that Luiz had a free jump, which also meant Mannone couldn’t come and claim the high ball. The second goal is much worse in my opinion, the only ball that Mata can play that position and threaten the goal is the one he ended up playing, the whipped cross to the far post that the keeper can’t commit to because of runners in front of him. If we had taken our line two yards outside our 18 yard box that ball offers far less threat, be braver and hold a line five yards outside the box and it poses no threat and he wouldn’t play it. When that ball was delivered we had already retreated to our penalty spot. I know I played a much lower level of football but if anyone of my defenders even thought about entering the 18 yard box before a free kick was taken they would find themselves on the receiving end of a short sharp kick in the arse. If they held their line the free kick generally got played to between the 18 yard box and penalty spot, if they dropped within the 18 yard box the ball generally arrived just outside the 6 yard box and the only thing that results from that is danger. The scoreline flatters Chelsea. They did not do enough in open play to win that game, the stats from Sky are below, we won every major stat apart from the important one and tackle success. We gifted that game to them today and that is what disappoints me most. Mannone 6 Needs to learn to organise the players in front of him, other than the goals had little to do. Jenkinson 7 What we are coming to expect, another solid game, confident on the ball, no danger came from his side of the pitch defensively and helped out the attack with constant running and making himslef available. Koscielny 5 Outmuscled by Torres for the goal, failed to organise the back line for the second. Vermaelen 3 You are a Centre Back, let’s concentrate on that part of your game first before you start popping up on the opposition 18 yard box in open play. Too eager to go to ground, must take charge of the back line at set pieces. Gibbs 7 Some good crosses and linked up well with those in front of him. Some very good tackles to win back possession. Arteta 7 Found it difficult to find his normal passing and was left slightly exposed. Cazorla 7 Not his best display but was still the most creative player on the pitch from either side. Ramsey 6.5 Struggled to find his rhythm in the second half, looked like he was tiring early. Gervinho 7.5 Well taken goal, tended to drop a little too deep in the first half. Giroud 7 Made himself available got into a couple of good positions, unlucky with a couple of decent efforts. Chelsea’s Champions League victory in May was a travesty of justice, a victory for anti-football and the luckiest run of games ever witnessed in the annals of football history. I have rarely been so disheartened by the result of a game because it appeared the ends justified the means. The only positive of the evening was the laugh JT gave the country as the cup was raised. But, and here is the rub, the shame of winning with such an appalling display of negativity has had a remarkable effect upon the Southern Oilers footballing ambitions; the signing of Hazard , Moses and Oscar indicates a shift from the pragmatic to the artistic; I hate to say this but I have enjoyed watching them this season. It is early days of course and the cold winter light may alter their footballing ethos but the signs are that Chelsea could once again be called “The Entertainers.” Who would have thought it? Is it Abramovich or RdM who is directing this change? Either way it is good for those of us who love attacking imaginative football. However, before I run away with the idea that Chelsea have turned from bottom feeders into shining lights, it must be recalled who remains their club captain. Can you imagine such a reptilian character keeping the armband at Arsenal after his history of awfulness? Tony Adams went through some difficult times but found redemption, Mr Terry has neither the will nor the gumption to follow suit. Let us hope for a repeat of last season’s comedy performance. Then there is the odious fool Cashley. Brilliant footballer and possibly the best left back of the last 10 years but what a plum. I must admit to having a grudging admiration for Fat Frank – it must be pointed out that at no time has he publicly supported his “mate”. If anyone has made the most of his talent it is him and FF seems have grown up. Thankfully his star is finally waning because I cannot forget his fist pumping in front of my face at the end of the CL game at Highbury. So, the Blues have an array of talent only equalled by Barca and ourselves, but where are their weakness?. All over the park! They have yet to really gel as a team, they are dependent upon the midfield to score goals, the defence is aging and if Crazy Luiz (he reminds me of Crazy Ramon in Fistful of Dollars) is as “creative”as usual there are gaps to exploit. Cech is a shadow of the keeper he was 3 years ago. They have no defensive midfield cover as Mata etc are no help, plus an over-reiance upon ObiOne Mikel will prove costly – he doesn’t have the discipline of Essien (why sell him?). Enough of them. Let’s talk Arsenal. Early season report:. Very good but could do better. We have seen the potential of this team which allowing for good fortune with injuries, refereeing and the bounce of the ball is good enough to go all the way. If we can continue to build upon the teamwork and hard work we will win today. Why? Because we are better than Chelsea, who let us not forget should be playing on Thursday nights. Teamwork is the key word. The triangles we have been gob-smacked by in recent weeks is entirely due to hard, hard work and of course, considerable skill. Mr Wenger’s selection dilemma’s are in central defence and on the wings. The return of our captain to fitness does not automatically mean a return to the starting eleven. How can you drop Koscielny after his game at the Northern Oilers? The man was superb. Mertesacker has been imperious and hardly put a foot wrong, his awareness has been vital to our defensive improvement, which is why AW bought him. Conversely, Chelsea will not be lumping long balls into the box but will rely on pace and trickery, so perhaps BFG is the man to get a rest. The Corporal will get the biggest test of his short career. He will rarely come up against the talents of the man he will face today, Hazard is one of Europe’s finest players and regularly switches wings. How Jenkinson copes could be key to the game. Gibbs has really improved defensively and as has been pointed out tends to sit closer to his centre back. This allows for more crosses into our box but denies the runner space to cut inside (hope my poor attempt at tactics is understandable). In midfield, can Ramsey be dropped after such an impressive outing last Sunday? Should we play 4-4-3 or the 4-4-2 which worked so well? Would you start Asharvin who looks in top form? On the wings, Theo played midweek which indicates he will not start today, but then so did Giroud. Will they both be on the bench with The Mekon continuing centrally? Will we see O-C start on the right? It is great to have so many alternatives and that is without the return of Wilshire, Sagna and Rosicky! The bench will be as powerful as we have seen for many seasons, though like Kelsey I worry about the lack of experienced cover between the sticks, Friedel has shown the value of such a signing – I understand the chap below hasn’t got a club. I would like to see us start fast and attack through the flanks. Some accurate long shots to challenge the visibly impaired Cech (hopefully the midday sun will be in his eyes). Whatever happens this afternoon we should be in for a feast of football and I am deeply envious of those attending. Do you remember the game against Liverpool when young Theo slalomed his way from our own half past what seemed like the whole of the Liverpool team to set up the late equaliser? Tell me you weren’t jumping up and down when that was happening? Do you also remember a similar run against Milan in the San Siro? Could we really live with ourselves if he moved and started producing runs like that on a consistent basis for someone else? Or worse, could we live with ourselves if he moved and had the opportunity to play more centrally and started scoring for fun. There is little doubt in my mind that he is a better finisher than Gervinho. 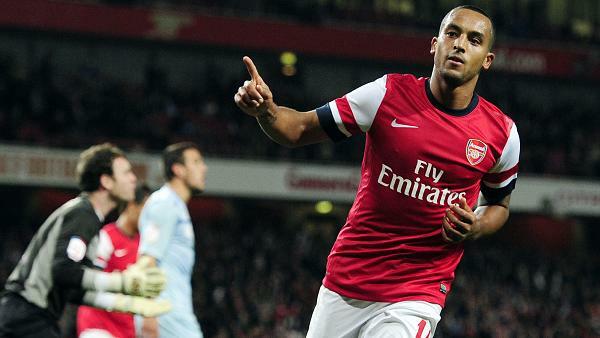 One on one, it has to be said that Theo is quite clinical. He scored 12 goals last season, set up untold amounts of assists for BSR and yet many Arsenal supporters remain unhappy with him. In fact, I would say that the last time all Arsenal faithful were united in support of Walcott was when Chris Waddle accused him of not having a football brain. Does that description above bring to mind a player without a football brain? What does that expression mean anyway? My interpretation is that he acts like a puppy with a ball more often than he should; that is to say, when he is moving at speed and the ball is played to his feet he either trips over it or runs past it, both are characteristics of a puppy to my mind. However, play it in front of him into open space and that is a different story – few are better. But, as we all know, open space in the EPL is a rare commodity, far more teams come to the Emirates and park the bus than arrive with the intention of attacking in an attempt to win that way. We have seen it a thousand times before, teams park the bus and try and hit us on the break. The latest frustration we have to suffer is goal keepers still wasting time even when they have gone a goal down. Someone tell me how does that work? The most sensible view is surely that it is better to have Walcott than not to have him. Hhhmmmm, or is it? Would we be better of without attackers such as Arshavin, Chamakh and Walcott eating up valuable wages and replace them with one proven out and out goal scorer? On Sunday, we faced a side called City that played in sky-blue. And last night, it happened again. Except the City from Coventry is very different to the one from Manchester in one key respect: Sheikh Mansour did not decide to take his country’s cash to the Midlands. Coventry City were once a proud and persistent member of the top division, ranking only behind Arsenal, Liverpool and Everton for their unbroken run at the top. They managed a couple of sixth place finishes and an FA Cup that every Arsenal fan loved seeing them lift, when they beat Spurs 3-2 in 1987. All of that seems a long time ago now. While the coaching staff includes some familiar faces from Coventry’s happier days, like Richard Shaw and Steve Ogrizovic, Coventry provided pretty weak opposition yesterday. That being the case, it was a little underwhelming to see our team of youngsters and older guys with something to prove fail to get to grips with Coventry in the first half. Santos aside, no-one played badly, but there was little evidence of dominance against an honest but ordinary lower division opponent, which has a league record of W0, D3, L5 this season and lies joint bottom of League One. The only moment of satisfaction in the first half was seeing Olivier Giroud break his duck. It was clear from his expression that it was a relief for him too. Once again, he had been given precious little service in terms of viable opportunities to score, before Arshavin and Coquelin combined with first-time passes to send the ball through for Giroud to go one-on-one with the Coventry keeper. Giroud took his chance with a deft chip. Yennaris (surprisingly playing in central midfield), Oxlade-Chamberlain and Coquelin began to assert themselves before the end of the first half. Arshavin (who was finally being played in his proper position, as a number 10) and Walcott were both pretty low-key in the first half, but stepped things up in the second half. Whereas crosses and through balls were generally over-hit or inaccurate in the first half, the ball was knocked around with more confidence and more effect in the second half, with openings being created against a pedestrian defence. Giroud was given a chance to get a second, when the referee harshly punished Coventry by awarding us a penalty when Arshavin appeared to have run into a defender more than been bundled over. But before Giroud could take the penalty, there was an amusing interlude, when two streakers got onto the pitch. For one horrendous moment, it seemed the first one was going to go traditional and manage to get all his clothes off, but he had to make do with running around the pitch in boxers and socks. Our stewards tried to look nonchalant about it all, you could almost see them say “Really? You want me to run after him? Bloody hell….” But in the end, the intruders were nabbed and Giroud was allowed to take his penalty. Which he promptly missed. A second goal came not long after, when Oxlade-Chamberlain cut in from the left, exchanged passes with Arshavin and then sent a powerful shot towards the top right-hand corner and it flew past the keeper’s flailing hand. In truth, the keeper should have saved it, but it was powerfully hit, and the ball’s path may have deviated slightly. The Chelsea match substitutions were made on the 72nd minute, when Giroud, Coquelin and Oxlade-Chamberlain came off for Gnabry, Chamakh and Frimpong, a folk hero who was welcomed back with gusto. Arshavin had become increasingly influential through the game, and managed to get his first goal for Arsenal in almost a year to make it 3-0. The little Russian quickly controlled a clever chipped cross from Giroud, who had received the ball from Yennaris, and despatched a little half-volley into the goal. Ten minutes later, after Djourou had failed to convert a good chance from a corner, the very tidy Nico Yennaris played a beautifully weighted ball for Walcott to run onto – it was perfect for Theo; the ball in front of him, the centre-backs behind him. The Wannabe Striker had been gagging for a goal, and had been hogging the ball at times when he should have passed the ball. This time, however, in his optimum position, he sent the ball past the keeper and into the far corner. 4-0. Then Coventry had their moment. Their captain, Carl Baker, had been the only Sky Blue suggesting he had had something to offer creatively, and on 79th minute he sent across an absolutely beautiful cross from the right-hand side. Carl Jenkinson would have been proud of it. It took out the defenders and gave Damian Martinez no chance, with Callum Ball doing the easy bit by converting to give the Coventry fans something to celebrate. If Giroud had been given more service like that since he joined us, I feel sure he would have more than one goal to his name. A minute later, Serge Gnabry was played in by Arshavin. The young German went for a shot, which hit a defender and went for a corner. Arshavin and Yennaris exchanged passes form the short corner before Arsahvin sent over a pin-point cross, which the always impressive and smooth Ignassi Miquel headed back inside the near post for his first goal for the club. 5-1. And the best goal of the night was the last one. Theo picked the ball up around the centre circle with a lovely first touch, went past a defender on the outside (yes, he really did), cut back in and across the defender, and once he reached the penalty box, he sent a curling shot inside the far post for 6-1. In truth, he had more time than he would usually get, with the Coventry defenders visibly tiring, but it was a lovely one-man goal nonetheless. All in all, it was a fun evening. There were good performances from Yennaris, Coquelin, and Miquel; good first team debuts for Martinez, Angha (a centre-back playing at right-back) and Gnabry; a return from injury for Frimpong; good run-outs for Oxlade-Chamberlain, Arshavin, Djourou and Walcott; a goal for Giroud; and no injuries before the weekend. Chamakh was anonymous for most of his 20 minutes. The only really bad performance was from Santos, who looked way off the pace, and whose use of the ball was distinctly un-Brazilian. But hopefully, he was blowing away some cobwebs, he can play a lot better. And next up is an away trip to Brian McDermott’s Reading. More significantly, there is Saturday’s game against the suddenly creative Chelsea. Last night’s game does not tell us much about how well placed we will be for that game, but it can’t hurt to have just won 6-1. Arsenal cruised past Coventry on an entertaining night to secure our place in the forth round of the League Cup. Fifty eight thousand people turned up for this third round tie, incredible when you think of what a drab fixture this looks at first sight. Of that number, forty five thousand were Arsenal supporters; it was great to see so many fathers having a chance to take their young sons or daughters, more and more a rarity nowadays which is obviously a great shame. When we whoop the opposition so convincingly I feel comfortable speaking well of the opposition fans and it has to be said that Coventry turned up in numbers, eighteen thousand to be exact. No doubt many a father took his son or daughter regaling stories as they made their way down of the day when they beat Arsenal 3-0 on the opening day of the season all that time ago. It was after all their cup final and they played a huge part in making the atmosphere as good as it was. The team selection made sense; giving the captaincy to Djourou was inspired, I am sure it is not easy keeping someone as talented as he happy playing the role of forth choice CB. Wenger included three players who needed to prove something: Giroud, Arshavin and Thierry Walcott, these three drove the show forward. The Ox has nothing to prove so does not fit into that category; he just played for fun and was a joy to watch. The back line was as expected apart from the inclusion of Anger who I am afraid was poor. Santos came to life in the second half leaving only Miguel who was my man of the match. I should explain how I make my choice of MOTM, on Sunday for example The BFG was described as “imperious” (Chas) I agree, but I expect that from him, what I didn’t expect was Ramsey to raise his game as much as he did and because of that I would have given the MOTM to him. Against Coventry Arshavin ran the show he shone above all else, but once again I expect that from him, it was only Coventry after all but Miquel played over and above what I expected, scoring a well placed header to boot. If I had one little complaint I think Wenger was a bit too cautious playing Coquelin and Yannaris, both defensive minded players, in front of the back line. I would have preferred to see Eisfeld who is more attack minded rather than Yannaris who was average on the night, a description far less glowing than the reports he receives when he plays right back. Arsenal were in charge from the outset, the only surprise was that it took so long to get off the mark, half chances fell here and there until Coquelin stabbed the ball past the Coventry back line for Giroud to run onto with his left foot; the conditions were so perfect that the rarest of rare orchids would have flowered and unsurprisingly Giroud chipped the goal keeper and a huge black monkey leapt off his back as he turned to celebrate his first goal for Arsenal not long before the break. Wenger was obviously taking this game seriously by his team selection but I am sure he would have liked a cushion as quick as possible so that he could get key players off ready for Saturday. The opportunity to put some distance came when Arshavin was brought down in the box and the referee correctly awarded us a penalty. The Ox ran to pick up the ball and then protectively went to the spot in hope of taking it himself only to be met by Giroud who pulled rank or something like that and insisted on taking it. Goal number two looked a certainty but the conditions were not right, orchids did not flower and Giroud missed, the monkey that had flown off was only circling and came flying down to resume his place on the Frenchman’s back. Giroud mopped for the rest of the game. This minor irritation was quickly put behind us as the Ox showed everyone how to do it, launching an exocet of a shot that flew past the Coventry keeper to make it 2-0. Arshavin scored the third with a sublime take and tap in. This opened the flood gates and even Thierry Walcott scored a brace. Theo Central And C1 Cup Special. Priorities. Will winning the Capital One Cup remove the monkey of the 7 barren years tag? Well, will it? You know the answer to that, after all who won it last year? What this cup has become is a chance for us to see how the less well known Arsenal players are developing and give a run-out to the bench warmers, some of whom will be looking to impress prior to a January move. Who we see this evening is pure guesswork but surely JD will get deserved pitch time. Then there is poor Meerkat – how the mighty fall – just a couple of years ago Arshavin was Captain of Russia, and one of the most in-demand players in Europe, now he is not even part of the Russian squad nor a starter for Arsenal. The proposed sale to his home club of Zenith didn’t materialise and he is sadly in limbo, a lovely man, I hope he finds a club where he can reproduce his mercurial talents. A couple of goals tonight would be a good advert. Goalkeeper is likely to be Shea, but who knows, it could be Don Vito. We should see the developing talents of Yennaris and hopefully Eisfeld, of whom much is expected. Miquel is a sure starter and from what we have seen looks a very talented player, I hope we can keep him but with such quality ahead of him will he remain patient? Now we come to a big issue. In a BBC interview Theo stated that a condition of his signing a contract was the realisation of his desire to play centrally (at least that is my reading of his statement). My first thoughts were – you must be joking! Firstly, no-one can or will dictate to Mr Wenger, and secondly, when playing centrally Theo has hardly been threatening. 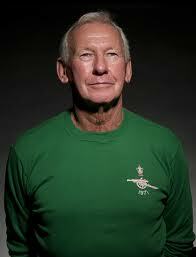 It says much that despite a dearth of strikers consecutive England managers play Walcott on the wing, neither Capello nor Hodgson have given him the main striker role and yet, the man himself believes this is his future position. Based upon what? A belief that he is Thierry Henry re-incarnate? That said, why not give him a try? Perhaps he can become the lethal finisher Theo obviously believes he is, but with Giroud and Chamakh (and now Gervinho) ahead of him it is unlikely he will be given the chance. The trouble is that 20 minute cameo’s will not be enough to persuade Walcott to sign a contract at a club he obviously loves. Time will tell if he has a place at Arsenal. So who plays upfront tonight? If fit, it has to be Chamakh. The big man needs pitch time in order for Arsenal to persuade some mug club to buy the big schlump, because at the moment even Peaches’ Mum has more chance of a first team start. If he isn’t available Giroud will get more pitch time. Or could we see both Chamakh and Giroud start with Cham on the left and Theo right? Whatever team lines up I expect to see some substitutions. Eastmond has done well in his few cameo appearances, Gnabry has been singled out for praise by AW, Bellerin is making huge strides in the reserves and youth teams and at just 17 looks a future first teamer (if he can dislodge The Corporal). Another Big Day for Nico Yennaris. A proper Gooner. As to Coventry, it seems a lifetime ago since the Sky Blues came to Highbury on the opening day of the season and beat us 3-0 (just the 19 years, Raddy). It has been a sad decline for this once fine club, languishing 23rd in League One and relegated last season. Mark Robins has much to do to improve their plight. The Emirates is sold out tonight. What a testament to the policy of playing second string and the attendant fun. 60+ thousand. Compare that to the 28k the Northern Oilers got last night for PL opposition or the 32k at the Bridge. Whether we win the Capital One Cup or not is hardly relevant, what is relevant is that Arsenal fans come out in vast numbers to support AW’s much criticised (by the media) approach to it. A win for the Arsenal, an outing for the 2nd team and a full house. What is there not to like? I’d be quite worried right now if I was a Northern Oiler. Manchester City may be the champions of England, but Sunday’s game left a strong impression that they are going backwards while the mighty Arsenal are moving forwards. They may have surged to success last year on a tsunami of oil, but now the tide is receding and if they’re not careful they might find themselves stuck in the tar. In the equivalent fixture on December 18th last year we lost 1-0 to a David Silva goal in a game we started with no recognised fullbacks. I remember thinking at the time that we might just have nicked a draw with a bit of good luck. But no honest Gooner could have come away from that defeat feeling we were the stronger team. Subsequently, of course, we earned a well-deserved three points against them at The Emirates – Mikel Arteta lashing home a memorable winner. We also had nearly 59% of the possession. Against the champions. On their own turf. In last year’s away game we clocked up only 467 passes (81% accurate) compared with City’s 416 (77%). And even in the home win in April we made a lot fewer passes than Sunday – 539 (82% accurate) against City’s 297 (75%). I find the statistics interesting because I did not think we were being especially “tippy tappy” at the weekend. I thought, in fact, that our attacking was quite direct at times – so it was a surprise to see that we made a hundred more passes than in last season’s home win. Digging into the figures a bit more, I found that one of the reasons for us seeming more direct while actually passing a lot more may have been the number of times our players took on an opponent. On Sunday we had 31 “take ons”, compared with 17 in the corresponding game last year and 19 when we beat the Oilers at our place. That’s a huge increase in the number of occasions our players tried to make something happen by beating an opponent. For me this increase in attempted dribbles, combined with more passes and a greater degree of passing accuracy, could prove to be the secret formula that will finally enable Arsene Wenger to realise his vision of a trophy-winning team playing beautiful football. Frankly, it’s what Barcelona do. When they are up against a good defence and can’t pass their way through them, they rely on players like Messi, Xavi and Cesc (when he’s not getting splinters) to force a breakthrough by dribbling past one or more opponents. Nothing plays more havoc with a team’s defensive strategy than an opponent taking on and beating a defender. The beaten player is temporarily out of the game, the defending team’s organisation is in tatters and new spaces open up for the attackers. If you only do half of the equation – the tippy tappy passing without the dribbles – you can frequently end up frustrated, which was often the case with the Arsenal team built around Cesc. Remember all that sideways passing across the opposition box in game after game? To make sure that the number of “take ons” against City was not a blip, I checked the figures for our previous four EPL games this season and compared them with our first four games last season after the transfer window closed (I couldn’t see any point in including the games before then, such as the 8-2 at Old Toilet, when we were all over the place). This season we averaged 26 “take ons” per game in the first four games. Last season it was a fraction over 18. There is definitely something going on with our approach to the game. It may be partly to do with personnel (Gervinho is certainly playing with bags of confidence and looking to run at defenders all the time) but I suspect it also represents a subtle, but deliberate change of approach by Le Boss. I’m no tactical expert, but it really feels to me as if we now have a squad capable of controlling the ball like the best of the “Cesc teams”, but with an extra cutting edge from players willing to take on their opponents in the manner of Pires, Henry and Ljungberg (even if they have some way to go to reach those players’ heights). Incidentally, of our 31 “take ons” at the Etihad, 12 were by Gervinho. The next highest contributors were Ramsey (5), Jenks (4) and Cazorla (3). Podolski, in a quiet game for him, had zero. Apologies for the stats overload, but this new approach by Arsenal may be one of the reasons why so many of us feel that this year’s team is more balanced than previous years’. Early news from the Arsenal camp was that the Lion of Flanders had a thorn in his paw and wouldn’t play. Many of the pre-match debates had discussed playing Koscielny in place of the BFG but as it turned out fate had made the decision for us. Ramsey was preferred to either the Ox or Giroud for the 3rd place in the front three. Last season this tactic sometimes left us a little unbalanced. We would see. With a Mekon and a Klingon lining up against each other, visitors to the Etihad could be forgiven for thinking they’d dropped in on a Science Fiction convention. Would Arsenal reach warp factor 6? Arsenal began the first half dominating possession. 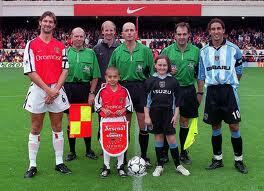 An early Ramsey centre needed a near post run and Santi fired in a long range shot from too far out to trouble Hart. A series of tika taka passes in the City half drew a foul from Kompany who seemed personally affronted that Arsenal were taking the urine on his home ground. At the other end Corporal Jenkinson easily dealt with a momentary threat from Sinclair and Aguerro managed to force a good save from Don Vito in the Arsenal goal. On 13’ Arteta played a delightful chipped pass to Gibbs who hurried a first time volleyed pass harmlessly across the goalmouth. Then came, perhaps, Arsenal’s best chance of the first half. A beautiful pass from Ramsey inside Cliché (Niall Quinn trying to outdo David Pleat) to Gervinho but his first touch was as heavy as Na$ri’s wallet. The Oilers rarely threatened with the BFG and Gibbs particularly impressive. On 18’ an excellent team move resulted in an overhit cross from Gibbs when the area was packed with red shirts begging for a decent ball. Then Jenkinson picked Lescott’s pocket, pulled the ball back to Podolski but the German blazed over with his right foot. Another super attacking move almost resulted in a golden chance for Santi but the man with a dead rat on his head just got back in time to intercept. In the 37th minute Gervinho hit the side netting and the Gooners at the other end of the ground thought it had gone in for one second, provoking much hilarity from the home fans relieved at something to laugh at having been outclassed at home for the whole of the first half. Santi still had time to create another couple of half chances before the break but to no avail. An excellent display from the little Spaniard, Man of the 1st Half by a country mile. Mankini used his tactical nous at halftime and brought on Rodwell to replace Sinclair who had had to climb out of Jenkinson’s pocket to go for his half-time cuppa. Nullifying Santi was obviously in the Italian’s mind despite his team going in one goal to the good. Citeh’s plan seemed to work immediately the 2nd half began. Either that or the Arsenal squad had been smoking a little something they’d brought back from Montpellier. Arsenal’s build-up became slow and ponderous. Gibbs again put in a poor cross after a delicious Diaby through ball and Jenkinson put the ball too close to the keeper when in a similar position to Tuesday night. The movement and fluidity of the first half had disappeared. Players on the ball had no options, meaning the ball often worked its way backwards. Gervinho sliced a couple of decent chances well over the bar and his comedy collision with Ramsey seemed to sum up the way the game was progressing for the Gunners. At the other end Mertesacker made a series of brilliant interceptions when the blue Oilers attempted to catch us on the break. His reading of the game is just sublime. The substitutions of Diaby and the Pod for Walcott and Giroud then seemed to open up the game. Jenkinson and Walcott fired in dangerous crosses. 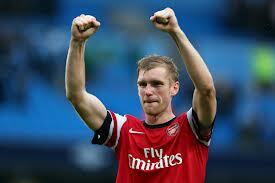 Mertesacker and Koscielny were called on to make some excellent tackles and interceptions when Citeh broke upfield. In the 82nd minute a real rasping drive from Santi forced Hart into the best save of the game and resulted in a corner. The ball bounced out from Lescott and Kos drilled the ball high into the net for a glorious equaliser. Cue pandemonium. A little period of keystone cop defending immediately after the goal saw Mannone make a crucial save before Aguerro put the ball wide. Ramsey made a great run, then the BFG another magnificent interception prompting the Away Boys into a chorus of We’ve Got a Big F*ckin German. 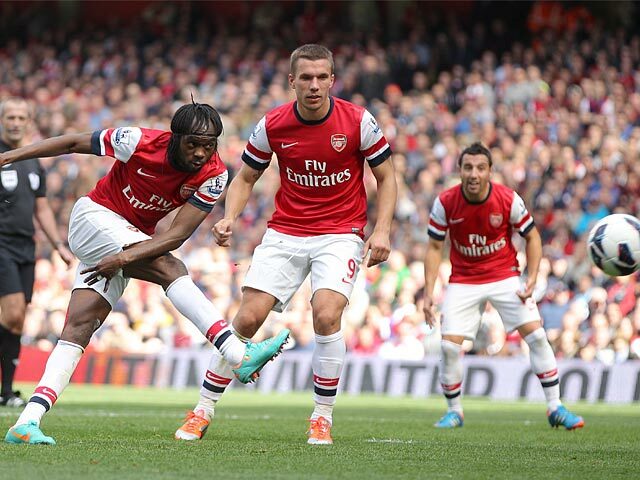 The last minute saw another excellent passing move from The Arsenal result in Gervinho again blasting over the bar. It wasn’t our Mekon’s day in front of goal. Garcia pulled down Jenkinson and was rightly booked but we’d already settled for a point. All in all it was an excellent point for the Gunners, Citeh being unbeaten for over 30 games at home, not many opposition teams even claiming a point in that sequence. The Away Boys were magnificent as usual keeping a rendition of Money don’t buy History going throughout the game and they warmly applauded the whole team off the pitch including my Man of the Match, Per Mertesacker.